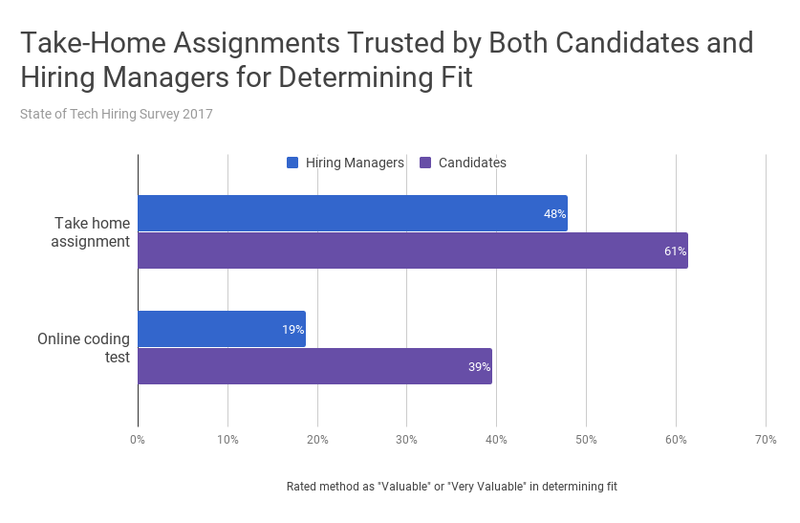 This talent expert polled hiring managers, recruiters, engineers, and designers, who overwhelmingly cited technical ability as the top hiring obstacle. You’re a hiring manager, and you’ve just had budget approved to hire an engineer. So you work with recruiting to source a pool of candidates with the right experience and background, conduct phone screens with the most promising ones, and invite the best of those to meet onsite with your team. But after a long day of interviews–or several–you get everyone together to share feedback, only to find that your top candidates aren’t meeting the technical bar. Employers and candidates agreed that when a job offer wasn’t extended, by far the main reason was technical ability. This was followed by cultural fit, salary, and logistics of the job (location, start date, etc). 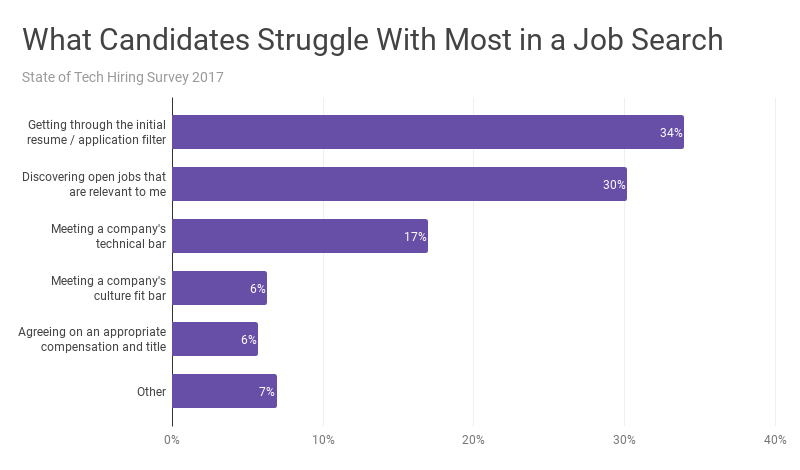 In addition to these, candidates were more likely than employers to cite a bad interview experience, or to simply confess that they didn’t know what went wrong. So despite the emphasis on culture fit and “soft skills” including emotional intelligence, this suggests that the challenge for most employers looking for tech candidates is finding those who are technically capable of doing the work. 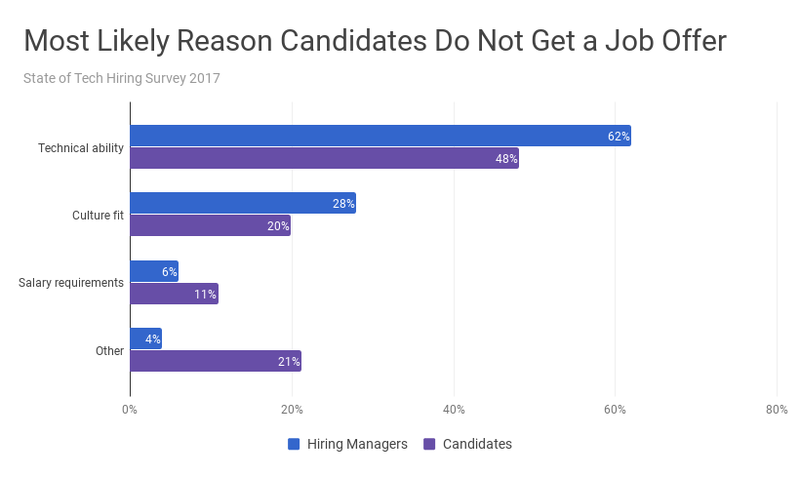 What can recruiters and hiring managers do? Here are three recommendations to try. Tech Ladies. Founded by a ex-Googler, this community of 20,000 women in technology offers a job board to reach women and gender non-binary professionals working in tech. Vettery and Underdog. Both (unaffiliated) platforms have similar models where employers can pitch candidates who are passively looking for new opportunities. Slack communities. Numerous public and semi-private Slack channels have popped up over the years, ranging from those for former colleagues to stay in touch, to full-fledged communities for certain kinds of professionals. Hiring managers can join these groups to connect with potential candidates and share new openings, especially since many typically have a #jobs channel explicitly for this purpose. Startuply has a great list of over 1,000 Slack communities to check out. The reason a candidate is rejected often has more to do with the company than the individual. And even when the reason is supposedly “technical ability,” that can mean different things at different companies. So it helps to get more specific than you think you need to be. How detailed are the job requirements around the role? Does the CTO care more about hiring an engineer who writes solid tests, gets working code up quickly, or makes key technical and architecture decisions? And if the answer is “all of the above,” remember that when everything is a priority, nothing is. Osborne has found that after coaching companies to expand on and prioritize the qualities they really care about first, it gets easier to make decisions about which candidates are a good fit–and have the technical chops to help the team succeed. It can be tempting to filter candidates on simple criteria like previous brand-name employers or the rank of their undergraduate college, but it’s rarely as effective as employers might hope. Many top tech firms did this for years, only to learn that college, GPA, and other easy measures have no meaningful correlation with performance. Instead, consider using work samples a core part of your evaluation process. Stanford professor Bob Sutton has argued that, looking at 85 years of personnel selection research, work sample tests are one of the highest predictors of on-the-job success. Portfolios, side projects, and GitHub repos demonstrate the kind of work that a tech candidate has actually done, meaning that those should be weighed more heavily in the hiring process. Work samples can be used in onsite interviews as well. By having candidates tackle concrete, job-related tasks, you can get a far better sense of their ability to succeed in the role. For inspiration, take a look at this list of 17 exercises WeWork uses to interview designers, including inventing a pet care product, a better way to manage waste, and designing a better news consumption experience. It’s important to understand what gets in the way of a good match. As much as soft skills like communication and emotional intelligence are critical to performing well, our research found that a lack of technical ability for the role is even more important. By widening the net, clarifying their requirements, and improving their tech evaluation methods, employers stand a better shot at finding–and keeping–their next great hire.